Handle your box of peaches like eggs. Set your box down very gently; peaches can bruise quite easily. Look through your peaches and remove any bruised or soft fruit for immediate use, just like you do with bananas, apples, etc. Let the peaches air dry if they are wet due to condensation after coming out of our refrigerated truck. Peaches are just like bananas when bruised – just cut away the bruised area and enjoy the rest of the fruit! 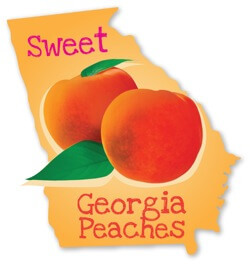 In order to ripen your peaches properly, DO NOT place them in the refrigerator at first. Instead, take them out of the box and spread them out on your counter or table at room temperature until they reach your desired level of ripeness (1-3 days). Once your peaches have reached your desired ripeness, then and only then should you place them in the refrigerator. Keep a watchful eye on the peaches as they ripen. For faster ripening, place peaches in a brown paper bag on kitchen counter. Upon being placed in the refrigerator, they should last an additional week or so. For maximum flavor, allow your peaches to reach room temperature before eating (about 30 minutes). Once your peaches are sliced, you can add a few dashes of lemon juice or coat with a citric acid solution to prevent excessive browning.